The Fill Station is a high-quality manual water bottle filling station or fill table that is commonly used in retail water projects such as water stores and bottling plants. It provides the easiest, fastest method for filling a variety of water containers for water stores. 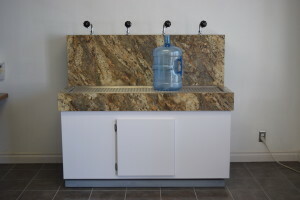 This water bottle fill station can be used to fill any container up to 20 inches tall (50cm) and is available in models ranging from 4 to 8 faucets. The Fill Station is available with an attractive Formica finish, custom Corian, or stainless steel. 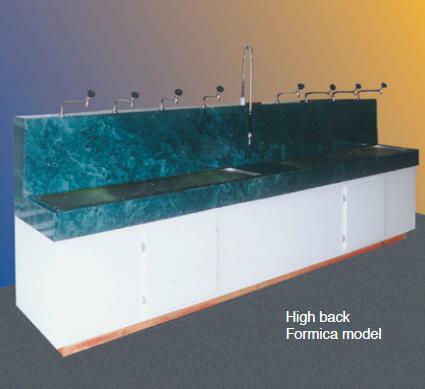 The Formica or Corian offer many colors to choose from allowing it to match the theme and colors of any water store or bottling plant. 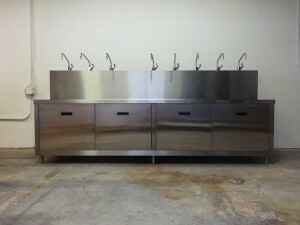 The Fill Station water bottle filling station features stainless steel faucets and sinks for a durable yet attractive finish. The Fill Station water bottle filling station comes with 4, 6 or 8 faucets for your convenience. All models of the Fill Station are pre-plumbed and ready to install upon delivery. All models of the Fill Station have stainless steel faucets with cross contamination guards to ensure that you are filling with uncontaminated water. This water bottle fill table is very popular in many water stores worldwide and is built to be very durable to withstand the traffic in water stores and bottle filling plants. The Fill Station water bottle fill table is made in the USA with NSF approved components and high quality materials. The Fill Station can be configured to be more than just a water bottle filling station by implementing an ozone bottle rinse in place of one faucet. For example, a 4-fill can be configured to have 3 faucets and 1 bottle rinse. We can manufacture it in any configuration to include any number bottle rinses and faucets you require. All of the faucets have an internal shut-off valve if you wish to close off individual faucets. Also the Fill Station can be configured to deliver different types of water to different faucets. For example, if you wish to have an 8-fill with 2 faucets for alkaline water and 6 faucets for purified water, the Fill Station can be easily manufactured in such a way or modified at a later date.